As a leading global supplier of consumer products, Spectrum Brands Holdings will use TSC tools to track improvement and continue implementing its sustainability strategy. 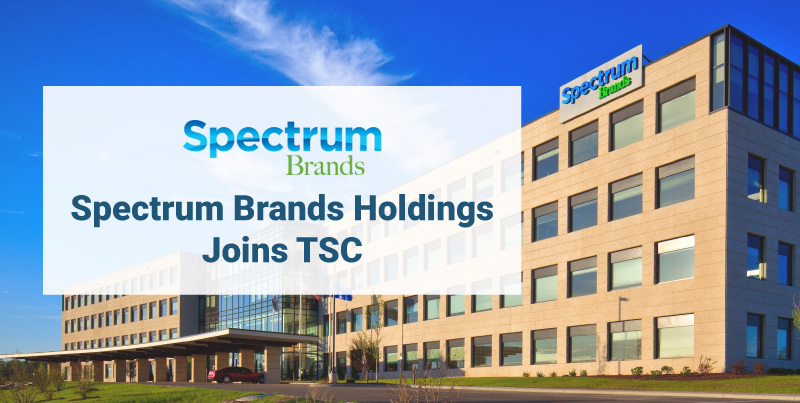 SCOTTSDALE, AZ, May 15, 2018 – The Sustainability Consortium (TSC) announced today that Spectrum Brands Holdings, Inc. has joined as a member, joining over 100 TSC members working to create more sustainable products for a more sustainable planet. TSC translates the best sustainability science into business tools that are used all over the world to create more sustainable consumer products. Spectrum Brands is a global consumer products company offering a portfolio of leading brands providing superior value to consumers and customers every day. They combine origin and destination logistics solutions with transportation services across all modes and regions of the world. They will focus their work on identifying environmental and social issues in their product supply chains, reducing their carbon footprint, improving water efficiency and developing an outreach program to positively affect the people in all communities where Spectrum Brands operates. Spectrum Brands regularly responds to the Walmart Sustainability Index, which is powered by TSC metrics and methodology. Because of the Index’s impact on measuring its sustainability progress, Spectrum Brands joined TSC to grow existing strategies and further leverage the tools, resources, and opportunities available only to members of the Consortium. Spectrum Brands Holdings, Inc. (NYSE: SPB), a member of the Russell 1000 Index, is a global consumer products company offering a portfolio of leading brands providing superior value to consumers and customers every day. The Company is a leading supplier of consumer batteries, residential locksets, residential builders’ hardware, plumbing, shaving and grooming products, personal care products, small household appliances, specialty pet supplies, lawn and garden and home pest control products, personal insect repellents, and auto care products. Helping to meet the needs of consumers worldwide, our Company offers a broad portfolio of market-leading, well-known and widely trusted brands including Rayovac®, VARTA®, Kwikset®, Weiser®, Baldwin®, National Hardware®, Pfister®, Remington®, George Foreman®, Russell Hobbs®, Black+Decker®, Tetra®, Marineland®, Nature’s Miracle®, Dingo®, 8-in-1®, FURminator®, IAMS® and Eukanuba® (Europe only), Digest-eeze™, Healthy-Hide®, Littermaid®, Spectracide®, Cutter®, Repel®, Hot Shot®, Black Flag®, Liquid Fence®, Armor All®, STP® and A/C PRO®. Spectrum Brands’ products are sold by the world’s top 25 retailers and are available in more than one million stores in approximately 160 countries. Based in Middleton, Wisconsin, Spectrum Brands Holdings generated net sales from continuing operations of approximately $3.0 billion in fiscal 2017. For more information, visit www.spectrumbrands.com.